Who are in these photos? And what's the occasion for Coffee with a Canine? I'm Andi Cumbo-Floyd — writer, a teacher, an editor, and a reader. Today, the pups and I are sharing coffee because, well, because it's today, and every day is a good day to spend with a dog. I've come out to the pasture — where Bella and Boone, the Great Pyrenees live — and Meander, our house dog, has wandered out, too, so we're all hanging out.... I'm trying to keep them from knocking the coffee mug out of my hands, and they are doing their best to show me just how much they love me. It's pretty awesome. Coffee today is just a drip brew from a regular old coffee pot that I start up first thing when I make the rounds to feed the farm animals — dogs included — every morning. Today, we're drinking Trager Brothers French Roast. Trager Brothers is an organic, fair trade, rainforest alliance roastery that is just a couple of mile from the farm here. I love their coffee, and I love that I can buy it from a garage-turned-roastery in my town. No treats for me today, but just for this occasion, I did give each pooch a rawhide chewy (I know, I know, some of you hate them, but our dogs love them). Boone has already buried his down the hill under the brush. Bella is chewing hers inside one of the goat houses, and Meander has abandoned hers for now because a chewy does not compete with the joy of other dogs. Meander got her name because I have always wanted to have a big pack of dogs named for words that mean "to walk slowly." So she is Meander, sometimes Mander, sometimes Mander Pander, sometimes Super Mander Pander, sometimes Super, and sometimes Soupy — we believe in going long and short with nicknames here. 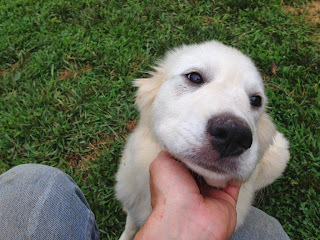 Boone got his name because a farm supporter, Chris, took to heart our initial idea of having an American West theme for our pasture, so Boone is named after Daniel Boone. I often call him Boonedoggle. Bella's name came because I wanted to have another B to match Boone, and because I always loved that show Belle And Sebastian when I was a kid. The dog in that show was a Great Pyr, too. Her nickname is Bella Bear. I adopted Meander from the local SPCA, just a mile from the farm. Boone and Bella were both adopted from other farms because they had spent time with goats and come from lines of guard dogs. 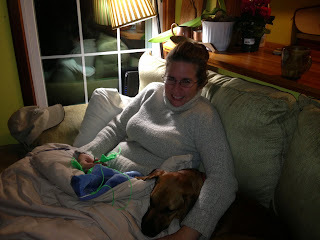 How do your dogs help--or hinder--your writing? Since I had to take a break before answering this question to let Meander in the house, there's one thing — Meander likes to go in and out a lot. But mostly, all three of them help me find joy in a hard day ... and they give me so much unhindered affection, which is something that doesn't always come with the writing life. Second only to my husband, dad, and in-laws, they are — with the goats and cats — my biggest fans. 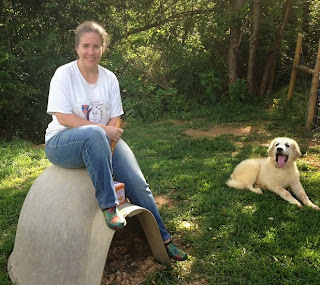 For the record, our chickens are ambivalent about my existence period, much less as a writer. You know, I don't write much fiction, but even in the novel I'm working on now, a dog doesn't appear. And that's interesting because I've had dogs — big dogs — most of my life. I'll have to ponder that one. 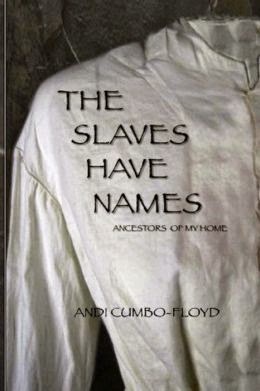 I guess I haven't really written much about animals in my books at all, although horses do come in — in a minor way — in The Slaves Have Names. Well, Bella and Boone live with our goats, so those guys are all buddies, but really, they are each others' best friends. They frolic, in the fullest sense of the word, together all over the pasture, wrestling and tussling. It's heart-warming. And I am Meander's best pal. 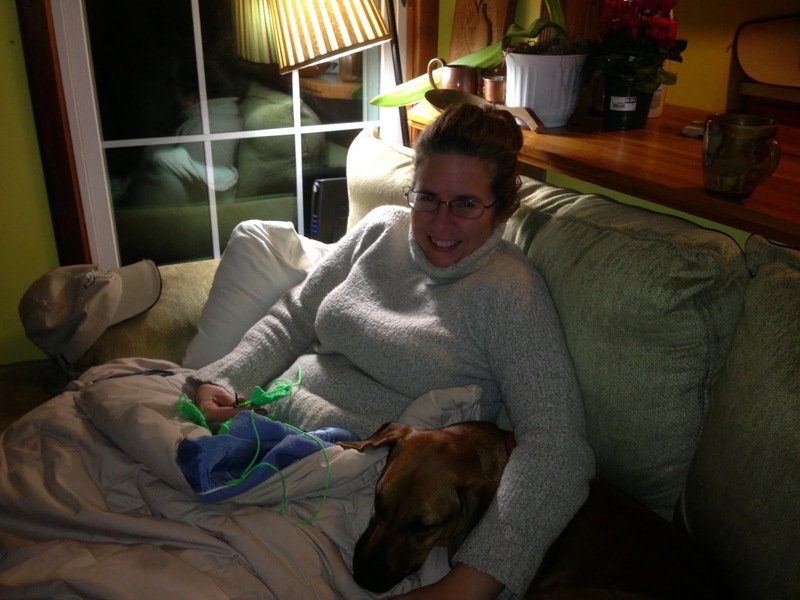 She and I are especially bonded, so where I am, she is usually there.... She likes my husband, Philip a lot, too. Meander is intensely loyal to me, and I love that. I've never had that kind of dog companion, and it's great. The puppies — well, we don't really know their full-grown personalities yet — but they are great guards. 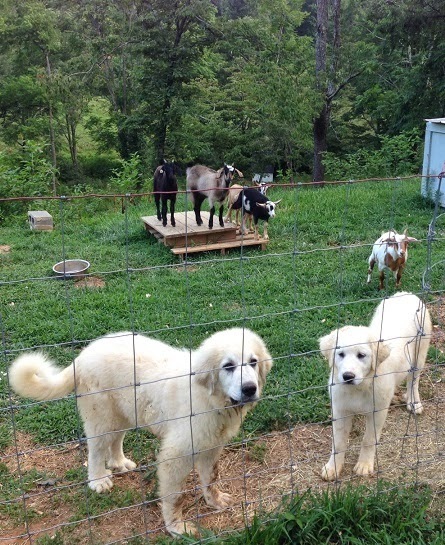 Boone barks and heads toward an intruder, Bella retreats to the goats and guards them. They make a great pair. If your dogs could change one thing about Virginians, what would it be? That's a great question, and I don't know if our dogs would think that way - as in think of people as Virginians. We don't think that way — we just love people — all people — when they come to visit here, no matter where they are from, what they believe — and I'd like to think our dogs take people in that way, too. In fact, I think they're probably better at it than we are. Boone would definitely be played by John Goodman. Bella would be Hilary Swank. And Meander would be Juliette Lewis. Visit Andi Cumbo-Floyd's website, Facebook page, and Twitter perch.